Once we realised that a number of library services had received Libraries: Opportunities for Everyone (LOFE) innovation funding to establish a makerspace (or similar) in one or more of their libraries during 2017/18, we asked them if they would like the opportunity to get together and compare notes. They replied with an enthusiastic ‘yes’. We also received enquiries from a number of other library services looking to undertake similar projects during 2017/18 using other sources of funding, so the invitation was extended to them as well. 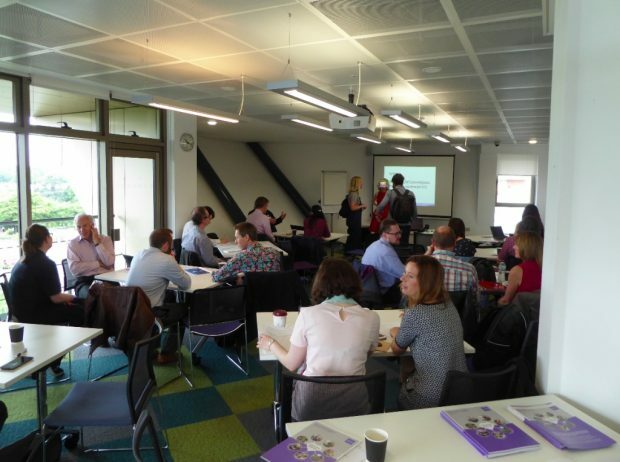 The purpose of the masterclass was to allow people who have already been on this journey (whether in the library sector or elsewhere) to share their experiences and lessons identified, with attendees being able to ask questions, compare notes on their plans, and look for any collaboration opportunities. To maximise their input, we limited speakers to a 15 minute presentation, but then ran a ‘speed networking’ exercise, where groups of participants had 15 minutes with each speaker to quiz them on anything they wanted to know. This was fast and furious - and an exercise in good logistics planning! - but got great feedback from participants and speakers so is a format we’ll consider again for future events. As described in Libraries Deliver: Ambition and the UK Digital Strategy, speakers agreed that makerspaces are a natural fit for libraries; as one speaker said “libraries are a studio for ideas. The maker movement needs libraries; it sometimes suffers from people making without thinking. The maker movement can benefit from working with libraries”. The benefits of makerspaces in contributing to many of the Outcomes set out in Ambition was a repeated message - not only increasing digital literacy, but also building stronger, more resilient communities, cultural and creative enrichment, helping everyone achieve their full potential and more. It was a common theme that ‘makerspace’ was a very broad term, able to be interpreted in different ways - all of which were equally valid, as long as they reflect community interests and needs. It was also recognised that the term ‘makerspace’ can be a barrier - people think “I’m not a maker, it’s not for me” - and, in those instances, it’s really important to highlight the activities they run and the opportunities to try new things [since the masterclass, we have attended Liverpool’s MakeFest and the follow up mail from one of the participants advertised a huge range of activities in their space, ranging from welding to mouse taxidermy!]. All agreed, however, that the strongest centres work when there is a core purpose and clear vision for what the centre wants to achieve, as well as strong links into the community and with local (and sometimes national) partners, eg with FabLab and/or links to local business and universities. Everyone recognised the need to consider long-term sustainability, but acknowledged that, in order to fully understand and test what the community wanted to do in the makerspace, it was better to start small with some seed funding and a fairly narrow range of equipment and activities and see what happened. The makerspace could then be iteratively improved and added to depending on what worked. Some existing spaces had a primary corporate sponsor, others had a network of supporters - no one model fitted all. People talked about the cultural aspect of makerspaces - as well as other supported Outcomes - having the potential to draw in funding from elsewhere within the local authority and from wider partners. Many discussions centred around metrics. People acknowledged it can be tricky to find common metrics across all makerspaces when they can be so different in their purpose and function. It was felt that this was perhaps something that attendees could work together to agree, ranging from practical numbers around footfall and engagement, to more detailed qualitative metrics around skills development and impact. Alongside this, it was important to recognise the value a space brings to economic development goals, and its contribution to social regeneration. A frequently repeated message was that key to the success of any makerspace are the people who get involved. Whether that is staff who have oversight, or the many volunteers who get involved sharing skills, running sessions and/or giving their time in return for use of equipment, the main qualification is a willingness to get involved and try new things, as skills and confidence will follow. All agreed that community input is critical - both to help shape the space and programme offered, and to reach out to different groups who may not be habitual library users. Skills development is important, as is confidence building - but the stories shared about people who actually got involved illustrated that nothing beats getting stuck in. Many of the people involved in code clubs talk about how they are often just one stage ahead of the students, but that is fine. A number of speakers highlighted the range of training materials and opportunities there are available, often at no cost. As has been mentioned in other contexts, it’s hard to run an open day in a place that is open anyway - but a makerspace and its programme of activities can be an excellent opportunity to advertise beyond the usual library audience and reach new people. And of course the side effect of bringing these new people into the library is that they can be shown wider library services too. We heard about the range of traditional advertising methods including posters, newsletters and social media, plus some teams had built a relationship with local radio, tied their schedule to local or national events (like Get Online week or Hour of Code). We also heard about investigating local creative groups, including the current trend for “Made in ……” shops, which are often a front for a diverse group of local creative people. Several of the presenters talked about the importance of telling stories. Makerversity, in particular, said they put particular effort into helping support their members to tell their own stories, and Barclays and From-Now-On had experience in producing videos of users talking about their experiences which had been extremely useful in getting across the value makerspaces can add to their community. There was a lot of advice and specific details shared about equipment, software, and support. Digital creating (design and prototyping) tends to be fairly well understood, and there were many detailed discussions about reliable equipment, and its related support, software and portability. However, the other avenues of making, whether with fabric, wood, vinyl, or food, were new to many, and there is lots still to be learned. Besides what people actually consider buying for their own spaces, speakers reminded participants that it was worth building relationships with other makerspaces in their region, as it was a community that thrived on referrals and sharing the more expensive pieces of kit. Presenters repeated the points made earlier: don’t try and do everything at once. Start > observe > adapt should be the model adopted. There was also an interesting debate about the age of participants. Many emphasised the focus on inspiring young people, but others reminded the group to involve families, and not to forget older people. Several spaces have appointed a maker-in-residence, a useful role which can complement the writer-in-residence or entrepreneur-in-residence programmes that library teams may already be familiar with. Following the networking discussions, participants were allocated into different groups (with the aim of getting everyone to talk to as many people as possible), and then given a series of questions to discuss. It’s impossible to do complete justice to the day’s discussions in a blog, but we have shared full notes of the masterclass with participants and via the Innovators Network. Please email us if you are interested in more of the detail. 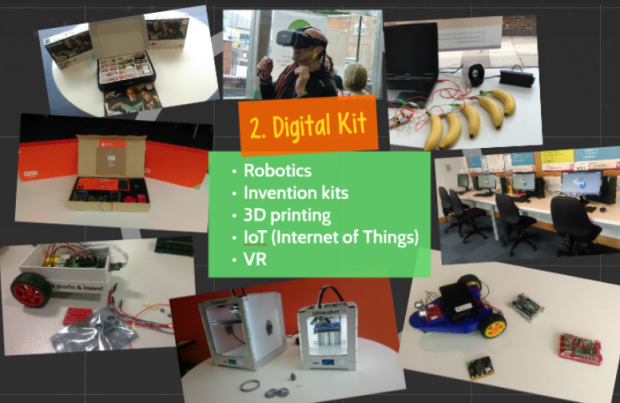 One of the suggestions that many participants requested was running another masterclass in the autumn to share progress with the makerspace projects. We are planning this for early September and will share details direct with people invited to the first masterclass. If you are looking to develop a makerspace in your library and would like to take part, please let us know. Finally, as mentioned on the day, we’re keen to promote your maker projects through our Libraries Taskforce blog, other publications, social media (@LibTaskforce), or ministerial / official visits, etc. Please contact Julia Chandler as you plan launch events and run activities so we can help you get the widest coverage possible.